I’m generally not a fan of shop bought ready-to-roll fondant and modelling paste. They usually taste unpleasant or behave in unpredictable ways or take too long to get used to using. I almost always make my own fondant because, for me, there is nothing more important than flavour. This habit has been handy as being familiar with making fondant makes it easier to adjust shop bought ready to roll fondant to better suit a project. I have the luxury of time, I only make a couple of cakes each month. Even though my fondant recipe is very easy and fast to make, if I was making 5 cakes a week I would not have the time or energy to make my own fondant as well. Similarly, if I get caught short for time, or I’m just not feeling great I will occasionally turn to bought fondant. So it’s important to still be familiar with what’s available. 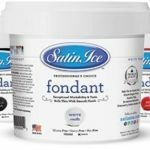 The Australian market for fondant was for many years dominated by Bakels and Satin Ice, and these were the only options I could purchase with any ease. 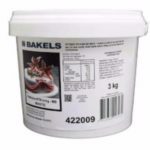 Bakels is fine to cover cakes with and easy to work with. Satin Ice is great for fine or small modelling work as it takes a little longer to set, but I found it quite soft and elastic so it takes a little getting used to when covering cakes and it tore too easily when covering cakes. I would use these brands only when I needed a clean finish on a cake, but they both have an unpleasant smell, even after they dry, and they don’t taste great. Whenever I used these fondants on cakes, the cake would look great but, people would peel them off and discard them. So I went back and refined my own fondant recipe and stopped using bought fondant for the better part of 8 years. They’re solid performing fondants and are the preference of several professionals and I’ve seen professionals do truly amazing things with Satin Ice and Bakels. I don’t use either them because I am repulsed by their taste and smell and I can’t get used to their stretchiness. In the last 5 to 10 years more brands have entered the Australian market and the quality and variety of products around have improved. Now there are so many other options available. Two of the relative newcomers are Fondtastic and more recently Renshaw. I tried both – here are my thoughts. I love the way Fondtastic covers cakes. It’s very smooth and very soft making it really easy to hide seems and get a smooth finish. The downside is that it tastes and smells awful, really awful. I would not willingly eat it on its own. It’s very greasy and doesn’t ever really dry out hard. This is part of what makes it great for achieving a smooth finish on a covered cake, but I found it a major nuisance as it will mark easily if I bump it lightly while I’m decorating. It’s not great for sculpting with straight from the pack as it’s way too soft and takes weeks to set, however, with a LOT of CMC or tylose powder it will form a paste that is very nice to sculpt with. When I tested it, after adding enough CMC to make it stiff enough to sculpt, this fondant took more than a week for small pieces and small sculpts to dry. I would not use it to make plaques or more structural pieces, Bakels and Satin Ice still manage to taste slightly better than Fondtastic and my own homemade fondant is much better for most projects, so I have not felt any need to purchase it ever again. This is one of the newest to our market and the last bought fondant I tried. I was dubious at first about using Renshaw, it’s got a good name overseas but I figured like a lot of products that do well elsewhere it might not work with our climate. 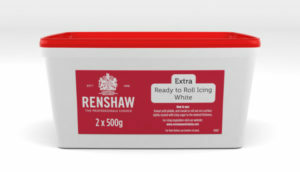 I discovered in several cake forums that Renshaw Australia worked really hard on the formulation and asked for feedback from Aussie decorators to make sure Renshaw Extra fondant is balanced for our climate and heat. I was still a little dubious, that was until I tried it… The first impression I had on opening the pack, was that the smell, although better than other brands, was not especially great, but it dissipated really quickly leaving a faint, pleasant sugary smelling, near odourless icing. This is a major point in their favour as the smell of most ready to roll fondant makes me feel ill even after it dries. Most importantly Renshaw also tastes really good, almost identical to my basic homemade fondant recipe. I have no hesitation about using it on anything because I know it will not affect the flavour of my cakes or biscuits, and I’m even quite happy to munch on it on its own. This is the only non-chocolate containing RTR product I would ever willingly eat on its own… That’s a massive achievement for a ready-made fondant! The texture is quite firm. It’s very firm right out of the pack, but it’s quite elastic when it’s warmed up from kneading, but it’s firmness means it’s not prone to tearing when covering a cake. It’s not as soft as Fondtastic or Satin Ice and has a better overall structure that’s easier to work with. It’s got a generous drying time. The magic of this fondant is that although it takes a couple of days to dry hard, the surface firms up quickly enough that the cake can be handled fairly easily without damaging it or leaving marks. Hitting it with steam will finish it off nicely, the heat also helps set the surface so it will dry a little firmer and shinier. It’s very easy to cover cakes with and isn’t prone to stickiness, a light dusting of icing sugar was all it took to prevent it from sticking when rolling it out. It is also a dream to sculpt with and a little CMC or Tylose will give it enough stiffness for structural elements and more structured modelling and sculpting. I have used it to decorate sugar cookies for a tutorial I made and to cover cake boards with good results. Once covered, placing the cake board or sugar cookies in an oven at 80 degrees Celsius for ten minutes will set the fondant hard so it can’t be dented and provides a solid surface to decorate. It comes out of the oven very soft and firms up like dry, like hard-set royal icing once it’s cool. I used my test batch of Renshaw on a wedding cake. I badly bumped the top tier when I was loading it in the car for delivery and left a massive dent in the top. I thought this was a disaster, but when I got to the venue I was able to use my fondant smoothers to get the tier back into shape with no issues. The fondant was set firm enough for me to lift the cake tiers from the sides without leaving fingerprints, but I was still able to fix and buff out a major dent in the fondant – after it had been drying for 24 hours on the cake. Any other fondant I have access to would have cracked or been so soft the bump would have broken through to the cake. This resilience in addition to the flavour is why it’s now my favourite bought fondant. I also tried a sample size of Renshaw flower and modelling paste, I like it but haven’t used it on a cake yet. My cake decorator friends love using it and like how it performs for them, which is very promising. I’m really thrilled with the Renshaw products I have encountered so far. 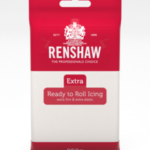 Renshaw is easily my favourite of the ready to roll brands I’ve tried – for taste, function and as an added bonus, customer interaction. They are reasonably priced and definitely worth trying. I look forward to experimenting with their other products. 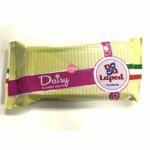 Two other pastes that are relatively new to the market are Daisy paste by Laped, and Cake Duchess Modelling Paste. Laped Daisy Paste and Laped Modelling paste are wonderful for making flowers and figurines. Daisy paste is quite firm, and allows for fairly fine flowers and sculpting and it stays flexible for quite a few days. The flexibility, even after several days, is great because it makes the flowers bump proof, less likely to break, and allows petals to be arranged to fill gaps to make a arrangements look fuller with a minimum of fuss. A small lump of Daisy paste can be heated in a microwave and forced into a lace mat with a bench scraper to create the fastest edible lace possible. So what are the downsides of this near miracle of sugary wonder? Well, it tastes like chemicals and sadness… It is “edible”, but no one would willingly eat it – ever. It’s also pretty expensive in Australia. It is great to work with and can speed up modelling or flower making, but it tastes so aggressively awful I consider it inedible, I wouldn’t personally classify it as a food product. The other downside is that fine flowers can droop in heat and humidity, this happens with a lot of flower pastes, but it means I’d never use it for competition work. I wouldn’t use it for anything I wanted people to eat either…. which defeats the purpose of edible lace and edible sculpted decoration. I wouldn’t use it… I have had a block of it in my cupboard for a year and used it only once when I was experimenting with it and have not felt the need to use it again. 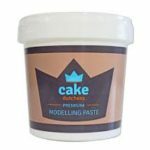 My other notable paste is Cake Duchess modelling paste. This is a specific purpose paste, It’s designed for modelling figurines. It ticks a lot of boxes for me, it smells and tastes amazing, there is nothing on the market as easy to use for sculpting. It takes colour really easily and it is just a dream to work with. It contains a lot of cocoa butter but still behaves like fondant. It exhibits the very best features of both fondant and modelling chocolate. The paste is firm enough that it is self supporting and won’t easily flop or lose shape on its own. It firms up and is quite solid at room temperature, making freshly made figurines very sturdy and stable and massively speeds up the sculpting process. It takes a long time to dry out completely, making it possible to make adjustments to completed figures without cracking them. 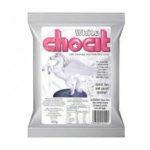 If you don’t make your own modelling chocolate, or your own modelling paste etc (and even if you do) there is nothing better on the market to work with for sculpting figurines quickly with a minimum of fuss. 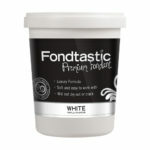 The only negative with this paste is that it’s designed specifically to be a modelling paste, although it’s priced competitively with other modelling pastes, it is too expensive to use for very large amounts of decorations and it would be massively wasteful to use it to cover a cake,it is a fairly “short” dough it is not designed to be stretchy it’s designed to model with. I love this product, but I make my own modelling chocolate in huge quantities. I’m not likely to buy it on a regular basis, but I will probably grab a tub of white to keep on on hand to use, mix, and match with my modelling chocolate for figurines because it is more heat resistant and can be handled for longer without melting than modelling chocolate. This is the best modelling chocolate on the market in Australia. It is very firm and easy to work with and takes regular gel paste colours well. I make my own modelling chocolate in 5 kg batches, so I have rarely bought it, but I use it in cake workshops and demos and I am super impressed with it. If you struggle making modelling chocolate, or can’t be bothered/have no time, this is the product to buy. DIY is great, but time is money, and this is a perfect ready made modelling chocolate. Grab a small pack to practice with, it goes further than you’d expect and it’s great for fine modelling, fast flowers, banners and is surprisingly good to use with Clickstix or Tappits and best of all it doesn’t dry out easily so off cuts can be reused, and finished practice sculpts can be squashed down and re-kneaded and the modelling chocolate can be used again for a different practice piece. Also, it’s chocolate based so it goes without saying that it tastes and smells better than any fondant or sugar paste ever could. This is just my opinion of the few products I have tried fairly recently. There is now more choice and lots more new and exciting products available to Australians than there has ever been previously. Products and product recipes get updated more frequently than you’d expect, so it is worth revisiting certain brands every few years. Also what a particular decorator is used to using and their preferred method of working makes a massive difference to how they will perceive the performance of a fondant. Ultimately it’s important to use what you are most comfortable with and use products that fit the project. Realistically most clients won’t ever eat icing flowers, and the ease of application of one fondant might be worth the flavour trade-off. I’m very particular about flavours and smells and I’m a bit old-fashioned in my preference for having only edible decorations I could and would actually eat on my cakes. There are always some exceptions of course, for example it’s not possible to create certain flowers or structures without wires or supports. Also, while it is nice to be able to make everything from scratch, it does take a lot of extra time and the benefits may not be worth the time it take to make a product when you can just buy it. The types of fondant available are so much more varied and of a better quality than they ever used to be. Get familiar with a few different products that will be readily available to you and use the product or a combination of products and home made products that are most appropriate to achieve a good looking finish in the most delicious, time-effective, cost-effective way possible. Don’t be afraid to experiment and don’t stick to just one brand or type of paste or product. They all have something unique to offer, weigh the pros and cons and find what works for you.